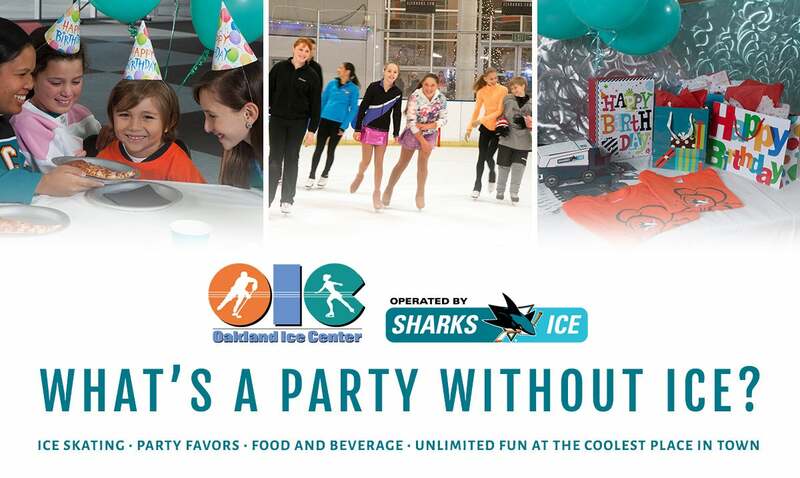 Let Oakland Ice and our Party Captains take the hassle away from planning and throwing your child’s next birthday party. Our Party Captains will help your party throughout Public Session, teach a skating lesson to all party guests and play games with the birthday participants throughout the party with special attention for the Birthday Child. Free Admission for the birthday child! $28.50 per guest (please contact our party coordinator if you will be expecting more than 10 guests). Party Captain as a host for your party. 2 hours of skating, skate rental included for each guest. Introductory Skating Lesson with your captain. Two Pizzas and two pitchers of soft drink (carbonated and non-carbonated options available). Add one more of each item for every five additional guests. Your package also includes plates, napkins, cups and a table covering for your party room. Fresh local bakery cake or cupcakes available for order or you are welcome to bring your own cake (if you bring your own, it must be commercially prepared. Please contact our Party Coordinator with any questions. Ask about our specialty catering menu! Full Payment is Required at time of booking. All sales are final. Sorry no refunds. You are welcome to bring a commercially prepared birthday cake and small gift bags. Additional Food Service is available at our snack bar. Selected items will be available for add on through the checkout process. All children are required to pay whether they are skating or simply participating in the party festivities. You may choose to have a combination of children and adults to meet your minimum 10 guest requirement. The birthday party child is free, which means they are not included in the 10 guests minimum requirement. Adults are not required to pay if they choose to observe only. "My daughter attended a birthday party today from 12-3pm. My daughter had a blast today with you today and while she has been hesitant to take lessons in the past she had so much fun with you today that she was asking if you taught any of the group skate classes as she would love to have you as her teacher! " Thanks for doing such a great job with them today!!! "I skate here often on an adult league and at times for the adult hockey classes, and in general, I like it. It's my meditation and exercise in one. At times the front desk staff, who are super nice, struggle to navigate their computer system and their website is confusing for being a big operation in the middle of the tech capitol of the world. But hey, it's more about the skating, right? However, this review is for the birthday party we had here for my 7yo son a couple of weeks ago. I exchanged a couple of messages with Zach, the man in charge of events there. It was pretty straight forward and he helped me set it up relatively easily. My expectations were pretty low. I figured we were essentially renting the little party room (which is frankly a bit drab) and buying some over priced pizza before we hit the ice to flail around with a bunch of kids. NOT the case. Zach and team were awesome. Super helpful, accommodating and friendly. The pizza was pretty decent, things went smoothly, and I was surprised to learn that the party included some of the rink to ourselves as well as a little lesson on basics for the kids. Zach and the other staff were really attentive to the kids on the ice. Showing them little tips, helping them get around and try new things. My 5yo daughter was crushing on Zach in no time, wanted no help from dad and only wanted to skate with Zach. CLICK HERE TO GET YOUR PARTY WITH THE SHARKS STARTED!!! !